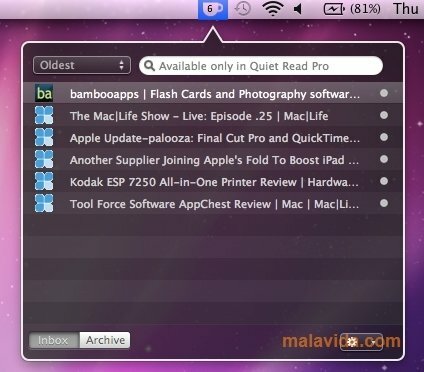 Quiet Read is a useful free application that will allow you to store links in a quick and simple manner. You will only have to drag the links to the corresponding icons on the toolbar to add them to your personal list. Thus you will be able to store information, that you will be able to access in the future. It is an alternative storage system to the classic favorites of your browser. It integrates perfectly into the taskbar, and you will only have to drag the links that you want to add to its icon. Thus, if you have to go away halfway through checking a website or you find any interesting content, but you don't have time to read it at that moment, you will be able to add it to the list and look at it later. Its icon is added to the taskbar, just beside the clock, and you will only have to drag the information there to add it. Thus you will lighten the workload of your browser, that is always a slave to the multiple tabs that you open when browsing on the Internet. If you want a simple and effective way to store addresses to check them later, you should try Quiet Read. This download only works on Mac OS X 10.6 or above.